Once upon a time I was a 14 year-old-girl entering high school and dreaming of becoming a cheerleader and half as cool as Elisa. Half of that dream came true and I was a cheerleader, not sure I ever hit the coolness mark though!!! I was THRILLED when Elisa reached out and I got to join her and her wonderful fiancé Curt for their engagement session when I was in Phoenix this spring, and I just couldn’t be happier to be a part of this couple’s wedding story! 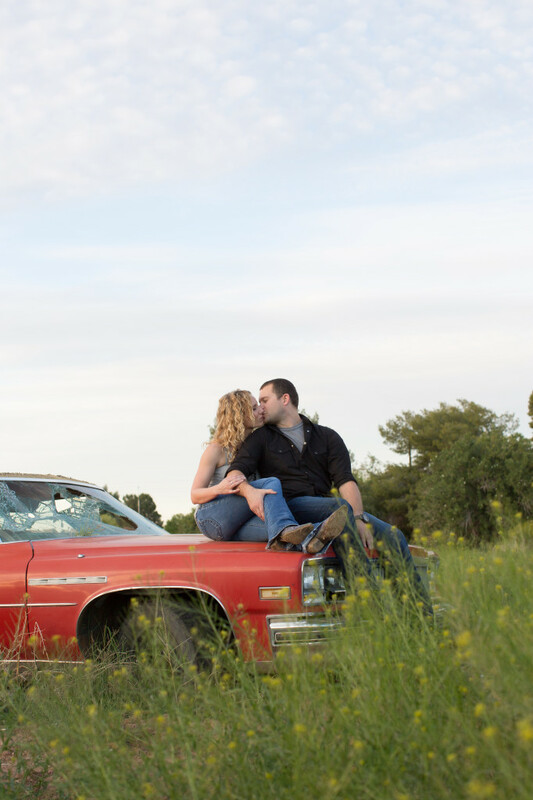 I am so excited for their big day coming in October and this session was so much fun! It takes pretty awesome people to jump up on a trashed old car (that’s backseat items let us know someone is definitely residing in said car…) and climb through brambles/tractors/etc to get some shots, but like I said, Elisa has always been the coolest chick! I am so happy she has found someone as wonderful and funny and sweet as she is, and I am so happy I get to be a small part of that story now!